This is a follow up post from the previous post on Decision to optimize for older iOS versions. Since the existence of iPhone and iOS in 2007, we do not have a way to confirm 100% on the percentage of different iOS versions in the market. We can only use some sample sizes by some famous mobile apps that share their statistics. From the statistics, we estimate the real distribution for different iOS versions. 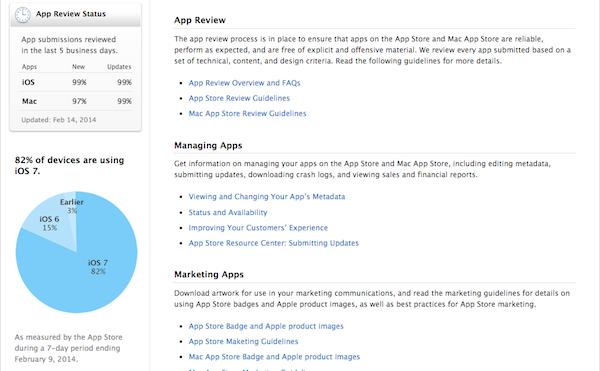 A few months ago, Apple has updated its developer portal webpage by letting the developers know the current statistics distribution such as the market share for different iOS version and also the App Review status for both iOS and Mac. This is a great update from Apple as the iOS developers do not have to guess the real distribution of the iOS versions again by collecting sample and statistics. As of 9 February 2014, 82% of the devices are using iOS 7, 15% of the devices are using iOS 6 and only 3% are still using iOS 5 and earlier versions. Updated on June 2014, 89% of the devices are using iOS 7, Less than 11% of the devices are using iOS 6 and below. After iOS 8 is released, the marketshare for iOS 6 and below could drop to below 5%. You may find the real iOS marketshare distribution from the Apple here: iOS market share distribution by Apple. Mobile Application development companies or developers now know that there are at least 82% of the entire iOS ecosystem is using iOS 7 since 9 Feb 2014. They could make the key decision not to spend time in optimizing the older version iOS such as iOS 6 and below. For me, the current project that I handled, I already dropped the support for iOS 6 and below.